Ideal to number your documents - up to 6 bands! The numberer has 6 bands with a character height of 5/32" (4 mm). The imprint size is 5/32" x 1-1/16" (4 x 27 mm). Each band contains digits from 0 to 9 as well as additional characters e.g. Euro sign on the first band. The 4846 is a self-inking stamp with a built-in ink pad to last for many thousands of sharp and clear impressions. It is supplied with a black ink pad as standard. To further extend the life of your stamp, order the suitable replacement ink pad 6/4911. Pads are available in black, blue, green, red and violet. 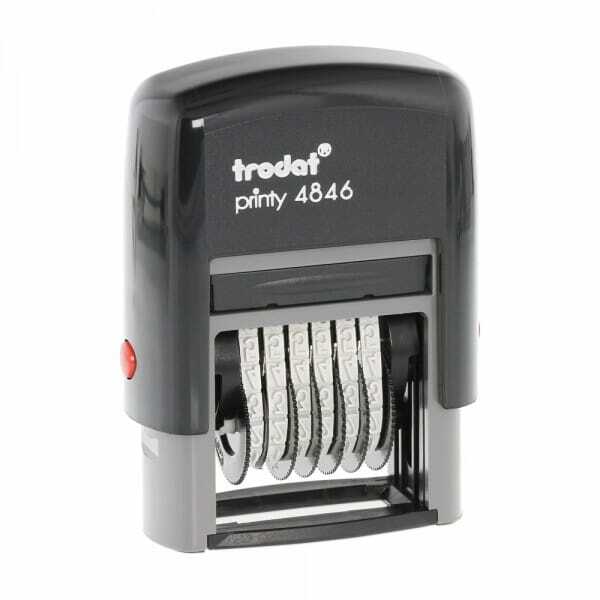 Customer evaluation "Trodat Printy Numberer 4846"
Great service, I apologize I had the wrong phone number in my signature and one of your Customer Service Reps was trying to get a hold of me, and I thought no one was getting back to me.. Thanks to your TEAM, all is well!! !